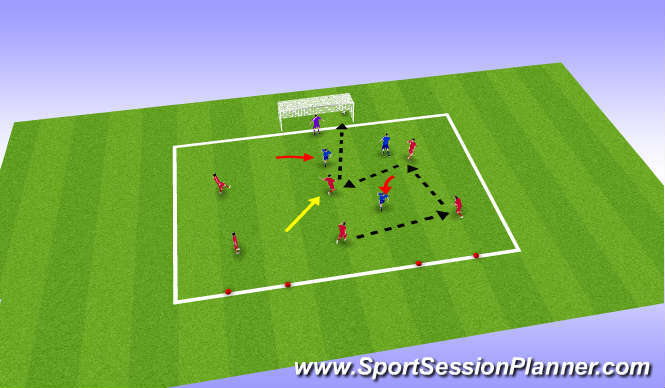 Organisation: An area of 25x25, A goal with keeper, and 2 little targets set up with cones on the opposite line, 2 teams creating a 6v3 game in the area, aim is for 6 attackers to score as many goals as they can in 5 minutes, but having to make 3 passes before they can score, if the defenders win ball, they can score straight away by finishing through cones. Keep scores and give everyone a go. Key Factors: Finishing, Movement, Awareness, Body Adjustment, Technique, Vison. Decision. 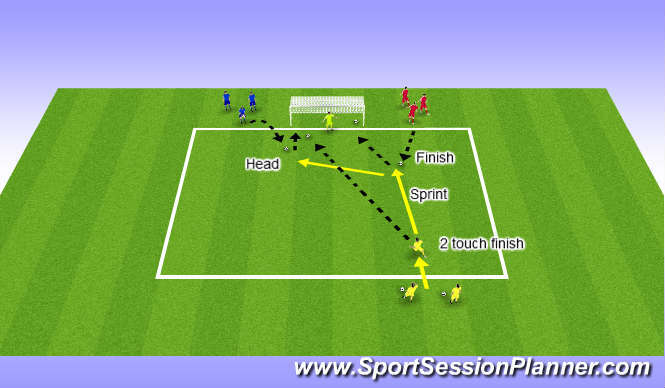 Organisation: A 4V4 Game on a 40x25 pitcha floater either side to be usedd for hitting crosses into danger area for what ever team passes to them, apart from that, no rules, just coach When needed on Finishing.